A beautifully renovated and superbly cosy Bed and Breakfast located in the historical garden township of Lorn. A delightful "cottage" with large spa bath and self-contained facilities to relax, conveniently located only minutes from Central Maitland. The property also has a heated pool for your comfort. 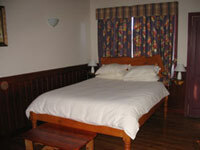 Hand built and crafted wood self contained bed and breakfast, including spa and kitchenette. Queen size bed with TV. Extra person welcome upon request. Cooked breakfast provisions supplied. The Maitland Visitor Information Centre offers accommodation and tour bookings as a free service however in the event of a cancellation or refund of monies a $22.00 administration fee will be deducted from your refundable amount. All refunds exclude the $2.50 online booking fee if applicable.